Sorry to have been absent for almost four months now. The UC Hopland Research & Extension Center has been in a bit of transition phase with some new direction and focus under the leadership of Acting HREC Director Kimberly Rodrigues. HREC's staff has accomplished amazing things in the last few months and we hope to share many of those accomplishments via the upcoming BLOGs. I, personally, have also been in transition .... moving from one office to another after 20+ years in the first location. That action along with updating to new photo-editing software and Windows 2010 turned a normal 15 minute Blog-post effort into an hour long learning ordeal. But, I am gradually getting the hang of it. For the past followers... you will recognize my favorite Fremont Cottonwood tree bathed in the morning sunlight. I simply cannot pass up the photo opportunity when this lighting occurs on this tree. 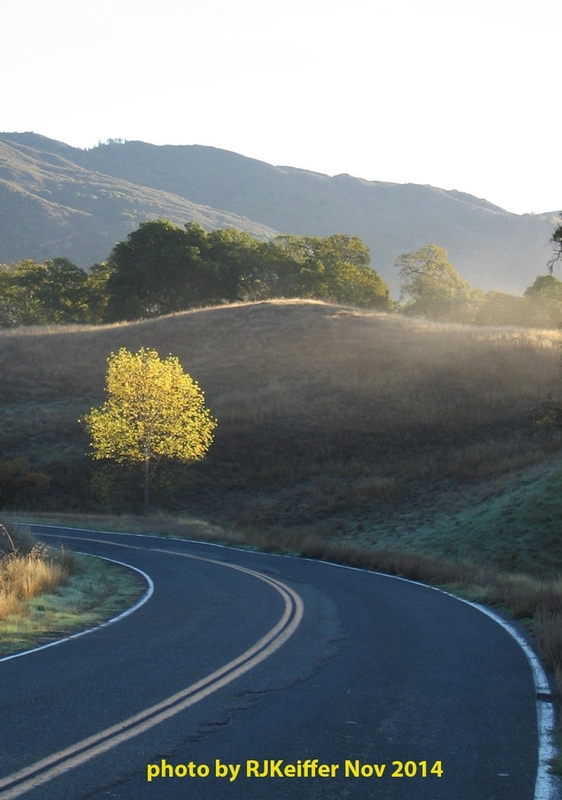 I especially like this photo since it represents the "Road to HREC" and the roadway path to new happenings at HREC.